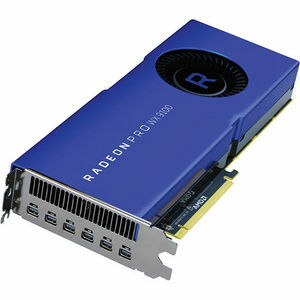 The Radeon™ Pro WX 9100 workstation graphics card is the ultimate, cutting edge graphics solution for all professional workloads from design and rendering to virtual reality. Based on the “Vega” GPU architecture, this card ushers in a wealth of bleeding-edge technologies like the High Bandwidth Cache Controller (HBCC), a radically new GPU memory hierarchy allowing previously untapped flexibility, and new frontiers in real-time visualization with hyper-realistic rendering techniques. The state of the art memory system found on the “Vega” GPU architecture removes the capacity limitations of traditional GPU memory. Thanks to automatic, fine-grained memory movement controlled by the high bandwidth cache controller, “Vega” GPUs equipped with HBCC enables creators and designers to work with much larger, more detailed models and assets in real time. The AMD Secure Processor is designed to facilitate all-day security. As soon as you power on your computer, the onboard AMD Secure Processor performs boot and firmware validation. During use, the AMD Secure Processor works in tandem with Microsoft’s Device Guard to thwart malicious attacks. During shutdown, the AMD Secure Processor continues securing graphics bound IP until device termination. The new geometry pipe in the “Vega” GPU architecture processes millions of polygons due to its efficient load balancing. The Radeon™ Pro WX 9100 offers up to 2.6x peak geometry through put per clock 4 to significantly speed up modelling and design workflows in various rendering engines. Modelling applications will be able to render in real-time heavy 3D models and large scenes. Updated rasterizer technology to improve cache locality and overdraw, enhancing rendering efficiency and leaving more headroom to crank up quality settings while maintaining smooth 3D rendering. Enable extraordinary performance and world-class innovation with Radeon™ VR Ready Creator products like the Radeon™ Pro WX 9100. Empower VR content creators and experience designers with amazingly powerful and capable development tools in the AMD Liquid VR™ SDK3.